AUGUST 7, 2018 - Ontario's two-year-old trotting fillies hit the midway point in their Grassroots season on Tuesday evening and, once again, three new faces graced the Woodbine Mohawk Park harness racing winner's circle. Rebellious Lady kicked off the Grassroots action in the second race and received a confident steer from Guelph's Scott Young. Starting from Post 2 the pair sat briefly in third as Galaxy Seelster led the field to a :30.1 opening quarter, but Young soon had the fan favourite driving toward the front. Rebellious Lady maintained a comfortable lead through the 1:01 half and 1:31 three-quarters and held off a late charge from pocket-sitter Galaxy Seelster to secure her first-ever victory in 2:00.1. Galaxy Seelster was one-half length back in second and Pyrrha was three more lengths back in third. "She's a very intelligent filly," said Young, who has driven the Angus Hall daughter in all three of her career starts. "She trots really well. I've been happy with her every time she's gone behind the gate." 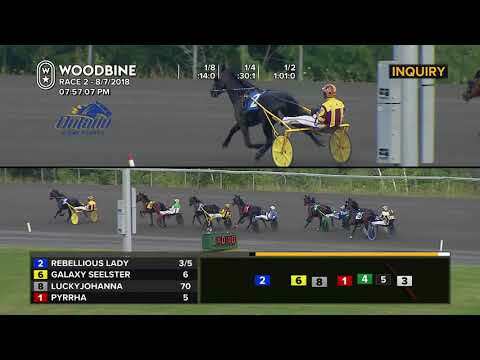 In her previous outings, Rebellious Lady finished fourth in the July 24 Grassroots contest and was third in a July 30 overnight event, both at Woodbine Mohawk Park. The driver's father, Bob Young, conditions Rebellious Lady for owner Hugh Fitzpatrick of Guelph. The filly, whose mother Radical Missy is a half-sister to former Ontario Sires Stakes standout and $1.9 million winner Majestic Son, was a $20,000 purchase from last fall's London Selected Yearling Sale. The second division saw lightly rated Blue Magic reel in pacesetter and favourite Order Mattie in the stretch to claim her first-ever victory. With the outside Post 9 driver Chris Christoforou, Jr. eased Blue Magic away from the gate and did not find a spot on the rail before the :28.3 quarter. The Campbellville resident bided his time in sixth until driver Wayne Henry tipped Kashe out in front of Blue Magic and followed that filly's lead through a :59.4 half and 1:29.4 three-quarters. Turning for home Christoforou shifted Blue Magic out from behind Kashe and the filly powered home to a one length victory in 2:00. Order Mattie settled for second and pocket-sitter At Will was third. Trainer Susanne Kerwood and owner Tommy Andersson of Rockwood, Ontario started Blue Magic at the Gold Series level, but she made a break in the July 15 season opener at Georgian Downs and finished sixth. In the Grassroots for her second outing the Kadabra daughter delivered a solid effort to finish fifth, but was still not quite as sharp as she had been in her first qualifier at Woodbine Mohawk Park on June 9. "Her first baby race (June 9) was very good, she come home good, she was actually very strong and everything, and then the second time (June 22) she was a little flat finishing. We drew blood on her and it showed that she had muscle soreness, like tie-up issues," said trainer Susanne Kerwood. "Tommy Andersson, he had her in Florida, and she was in great shape when she came up, but I think maybe with the heat and everything she tied-up. It was a hard time getting her back, but it looks like she's on the right track now." Kerwood believes Blue Magic, who was a $40,000 acquisition from the Lexington Selected Yearling Sale, has the potential to be a Gold-level horse, but may opt to keep her in the Grassroots for this season. "I still think she's a Gold calibre filly, but we'll see how she comes out of it. I'll talk to the owner and we'll make the decision after," said the trainer. "Maybe I'm a little too soft with them, but they're still just babies, right." Like Blue Magic, Kenogami Darling started her season at the Gold level, finishing sixth in both the July 15 and 27 events. The move to the Grassroots also proved beneficial for the Justice Hall lass, as she swept around stalled cover and powered down the stretch to a six length victory in 1:59.2. Fan favourite Splurge On Me finished second and Tymal Royalty was third. "She's probably right on the edge of being a Gold filly," said Bob McClure, who piloted Kenogami Darling for the first time Tuesday. ""She's a nice gaited filly who really wants to go forward." Dany Fontaine trains Kenogami Darling for breeder Jean Francois Reid of Anjou and his partner Claude Reid of Jonquiere, Quebec. The fourth Grassroots event for the two-year-old trotting fillies is September 1 at Hanover Raceway. The focus remains on two-year-old trotters at Woodbine Mohawk Park this week as the Campbellville oval hosts the third Gold leg for the colts on Thursday, August 9 and for the fillies on August 10. The colts will compete in Races 2, 5, and 8 Thursday, while the fillies battle in the fifth and ninth on Friday. Post time for both programs is 7:30 pm.